Two years ago, Indians used to send 9 SMS per day but in the month of July, 2013, only 2 SMS per day were sent! In a recent survey by Nielson, India, it was revealed that mobile chat applications such as Nimbuzz and WhatsApp have literally destroyed the SMS culture and usage inside India. Powered by internet, these applications are prompting Indians to ditch SMS which normally costs Re 1 to Rs 1.5 for local numbers and as high as Rs 5 for international numbers. On the other hand, the mobile chat applications are absolutely free to use and as a result, on an average, Indians are using these apps for 27 minutes a day. Facing the downfall of SMS usage, Indian telecom companies are facing the heat as well. 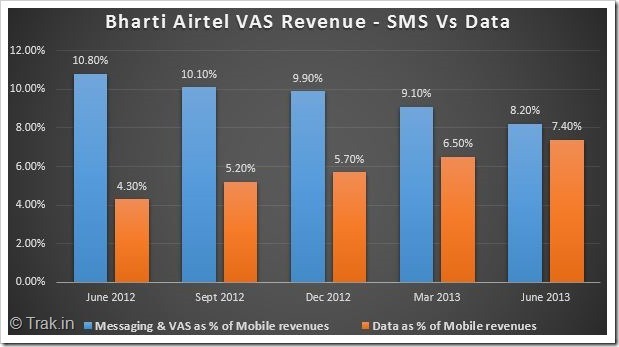 As observed, Bharti Airtel’s June quarter results for 2013 showed that the revenues from SMS usage have come down to 8.2%, compared to nearly 11%, a year ago. But in the same period, Airltel’s revenue from data usage (Internet consumption) increased to staggering 90% if compared to last year. See the chart that shows a clear comparison! Similarly, Idea Cellular is also getting less revenue from SMS as compared to previous years, but its revenues from Internet usage is at all time high. Its 3G Data revenue per user has increased by Rs 20 and currently it’s at Rs 109 in the June quarter, which is exponential growth in terms of Indian market. 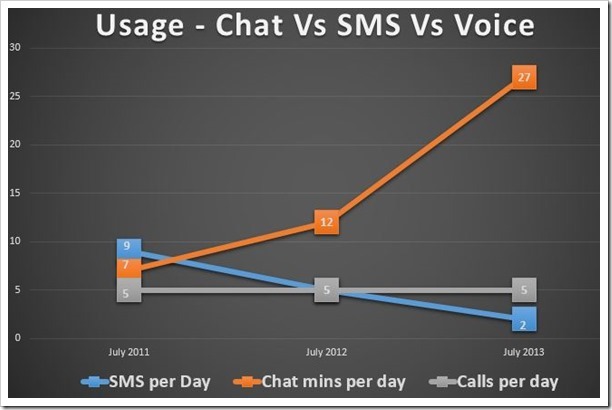 Not only SMS, but Voice usage trends of Indians will also give jitters to telecom companies. Two years ago, an average Indian used to make 5 calls a day and in July, 2013, the figure remains the same. This means that although telecom companies have added more subscribers, the voice usage is the same. Services which use Voice over Internet (VoIP) makes calling to any person in the world almost free. And the new and informed smart phone user from India is smart enough to know which services to use to keep his monthly billing low. Gartner India has already predicted that revenues from SMS would slowly extinct in Asia and rest of the world in coming years. I suppose that the time is ripe for telecom companies to look out for alternate revenue streams to counter this SMS void. And I hope that a higher data charge is not the option which they are thinking! What is your view on this? Do you actively use SMS today as you used earlier? Will you miss SMS if telecom companies decide to shut down this service? Share your views here! Right now Teleco’s are cashing on 2G packs by Hiking their prices and also to Increase 3G users who still use 2G on a 3G compatible Smartphone. SMS packs prices have got dearer because of Newly Introduced Inter-operator charges of 2p/sms and 100 sms/day limit. Telecom Sector has to take steps and make tariff’s a bit cheap and TRAI should allow at least 200sms/day to save Short messaging Service. I don’t text anyone anymore..I don’t even remember the last time I texted someone but I don’t think SMS usage will fall to zero any time soon. There are a lot of ppl having budget phones that do not support whatsapp, line,etc. hiking SMS pack prices is an option that telecom companies will cater to in near time..
SMS might become history as far as exchanging of information between contacts is concerned, But I feel they would still continued to be used for bulk messages/notifications from Govt/Police to all citizens/company officials to its employees /TRAI to mobile subscribers or any other regulatory body. If some internet based technology evolves to transmit these bulk messages, then surely SMS would be shut down. Bt let me tell you, mister, I am 78 years old, and I still receive SMS from my grand daughter. So, it should definitely not be stopped!! That is the only talk we have. I dont have internet. I live in a village. Every thing has its own value. I love SMS!